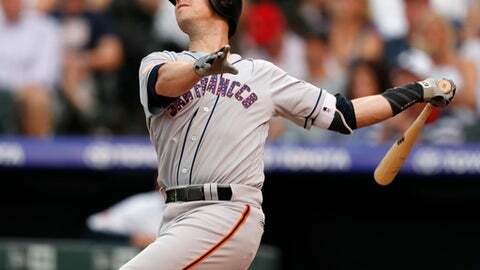 SAN FRANCISCO (AP) Giants catcher Buster Posey will miss the All-Star Game because of a lingering right hip issue that needs an injection to calm the inflammation. The hip has bothered him both hitting and catching off and on all season, so Posey is hopeful the time off will allow him to heal. Manager Bruce Bochy made the announcement before the start of the three-game series. The Giants had been discussing the possibility for about a month, Bochy said, and Posey is scheduled to have the injection after Sunday’s Bay Bridge Series game against Oakland. Posey began the day batting .285 with five homers and 27 RBIs in 74 games. Bochy believes the hip has affected Posey’s power. The 31-year-old Posey sat out two games in late May at Wrigley Field with soreness in the hip. ”It’s flared up on him. He’s missed some time because of it not too long ago,” Bochy said. ”Our hope is make it through this week and we can give him three or four days to get this thing cleared up.